Purpose Sends the player to a lucky area of the board (a coin filled path), where they can usually receive a free star. The Lucky Space is a space appearing in Mario Party 8 and every installment since aside from Mario Party DS. In Mario Party 8 there is usually only one on each board (with the shape of the space being different on each, including the tutorial). Each Lucky Space will transport the player to an otherwise inaccessible area (being a coin filled path) of the board, where they can usually expect to find a small area of Blue Spaces (with three coins) leading to a free Star (an exception made for Bowser's Warped Orbit, which instead leads the player to collect Bullet Candy or Bowser Candy from Candy Areas). At the end of the path, the player will return to the main board. In most cases, there is an unlimited number of Stars that players can receive from revisiting these paths (except Koopa's Tycoon Town, as that board has a fixed and limited number of attainable stars), or an unlimited number of Bullet Candy and Bowser Candy for the lucky area at Bowser's Warped Orbit. In Mario Party 9 and Mario Party 10, each board has several Lucky Spaces. They reward players who land on them with either Mini Stars or Special Dice Blocks. The Lucky Space first appears in Mario Party 8. Each Lucky Space does something different depending on the board. If players land on the Lucky Space, they will ride a floating platform to a large coin area platform behind the main board. 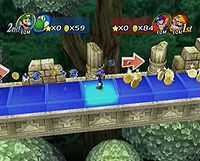 On the large platform is an area of Blue Spaces, each with three coins on them. At the end of the platform is a free Star and a Warp Pipe that will send players back to the start of the board. If players land on this board's Lucky Space, they will ride on a Dolphin and be transported to a small island west of the main path for free. On the island is a small area of Blue Spaces, each with three coins. At the end of the path is a huge Treasure Chest. Upon reaching him, players will meet the Goomba idols. They unwillingly give the character a star and then order some gulls to return the player to the main board, on top of the Lucky Space. If players land on this board's Lucky Space, they will go upstairs to the second floor in the mansion. This Lucky Space area contains a small area of Blue Spaces, each with three coins. At the end of the area is a Warp Pipe, which leads directly to King Boo. They still have to trade 10 coins for the star from King Boo, and King Boo will still shuffle the board if the Star is earned this way. If someone happens to be on the second floor when King Boo shuffles the board, they will be sent back to the start, making their progress a complete loss. Due to the randomized layout of the board, the Lucky Space can be located in any one of the main rooms (even though this board has one Lucky Space like all the other boards except Koopa's Tycoon Town which is the only board that has more than one Lucky Space). By landing on this board's Lucky Space, the player will be dropped off at Payday Waystation. It's a one-way area consisting of five Blue Spaces, each with three coins. At the end of the area is a Shy Guy, who will give the player a free star. Two other Shy Guys will then return the player to the back of the train via a handcar. A Koopa offering Luigi a ride to one of the Lucky Space paths. This board has two Lucky Spaces; and each result in a Koopa Troopa pulling up in a car to take the player to a place in town where the road is "paved with gold". If the player lands on the Lucky Space on the west side of the board, the Koopa Troopa will take him or her to an area to the west of the board, while landing on the Lucky Space on the north side of the board will have them taken to an area east of the board. Both coin paths consist of an area of either four of five Blue Spaces, each with three coins. In the middle of each Lucky Space area is a three-star hotel that can be owned for a starting investment of only one coin. When the end of one of these areas is reached, the player will cross the road back to the main board. Bowser, Donkey Kong, and Bandit are unable to deposit or steal coins from either of these two hotels. However, if another player lands on the same Lucky Space, they can invest and possibly steal the hotel. Landing on the Lucky Space here will cause a spaceship to land next to the player. It will open up revealing Captain Shy Guy, who takes the player to Shy Guy's Orbital Buffet. The buffet restaurant has a small area of Blue Spaces, each with three coins. It does not lead to a free star, unlike the Lucky Space on the other five boards. Instead, the player gets to collect three free pieces of either Bullet Candy or Bowser Candy by passing Candy Spaces before coming back to the Lucky Space. Lucky Spaces also appear in Mario Party 9. In this game, they trigger different events based on where they are placed. If the Lucky Space is near a Blue Warp Pipe, then the player jumps into an area with Mini Star Spaces. The player then rolls a Dice Block, with a higher number leading to a Mini Star Space which gives out more Mini Stars. If the Lucky Space is in front of a Toad House, the player enters the Toad House and has a chance to get items by picking shuffling cards. Unlucky Spaces also appear and serve as a negative counterpart to Lucky Spaces. When the Captain lands on an Unlucky Space near a Red Warp Pipe, they are warped to an area with Mini Ztar Spaces. On Blooper Beach, three of the Lucky Spaces towards the end of the board will trigger another event that causes Dolphins to appear taking the vehicle to Star Island (and the captain gets three Mini Stars on the way). The island, shaped as a star as its name implies, consists of a circular path made up of a Dash Space, three Dice Block Spaces and another Lucky Space. There are also two sets of three Mini Stars in between some of the spaces. The center of the island consists of ten Mini Stars. Players take turns attempting to land on the Lucky Space which allows the captain to obtain the ten Mini Stars in the center and return to the main path. The Dice Spaces here will never trigger an event (such as free Mini Stars) or a minigame. The island can be revisited as many times as the captain lands on the Lucky Spaces on the main path, which is infinite due to the placement of the Back Space just before the Bowser Gate. Two Lucky Spaces appear, three and four spaces ahead of the Thwomp challenge. If the player lands on one of the two spaces, he/she will take the cannon and skip nine to ten spaces ahead. There are two Lucky Spaces on this board. Upon landing on one, the player can take the Warp Pipe and move a random number of spaces further away from Bowser. In this case, it's the exact opposite of a Piranha Plant Space. However, at the end of the third round, one is changed to a Bowser Space. Lucky Spaces return in Mario Party 10. In the Mario Party mode, they allow the player to hit three Brick Blocks containing either two, four, or six Mini Stars; in the Bowser Party mode, they allow the player to hit three Brick Blocks containing either zero, two, or four Hearts. Receive (3 or 5) coins. Receive (7 or 10) coins. This event is exclusive to Kamek's Tantalizing Tower. Make a rival lose (5 or 10) coins. Make the rival team lose (5 or 10) coins. : This event is exclusive to Partner Party. Receive several Dash Mushrooms: This fills the player's inventory with up to 3 Dash Mushrooms. Receive several Golden Dash Mushrooms: This fills the player's inventory with up to 3 Golden Dash Mushrooms. Make coins rain around you. : This event is exclusive to Partner Party. This page was last edited on March 28, 2019, at 01:37.